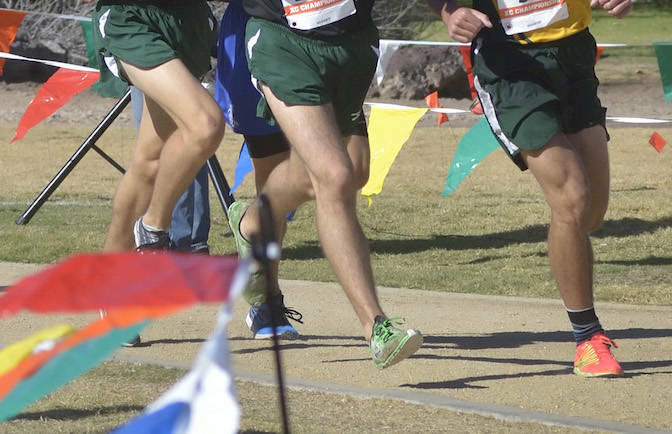 Arbor View’s boys cross country team grabbed six of the top seven spots, including the top three overall, as the Aggies easily won an eight-team race at Shadow Ridge on Wednesday. Arbor View had a team score of 17. Shadow Ridge was second with 52. Faith Lutheran (85), Bonanza (119) and Centennial (139) rounded out the top five. The Aggies’ Mario Gutierrez won the 3.1-mile race in 18 minutes, 19.75 seconds. He was followed by teammates Ethan Medrano (19:01.55) and Reznor Weist (19:03.85). Shadow Ridge’s Anthony Earl placed fourth in 19:32.91. At Foothill, Justin Neubeck won a 2.5-mile race in 14:07.9 to lead the Falcons to victory in a seven-team meet. Nathan Carlin was second in 14:12.3 to help the Falcons to a team score of 25. Liberty was second with 30 points as Foothill and the Patriots combined to take the top 10 spots in the race. Coronado was third with 77. Tech (134) and Basic (157) completed the top five. Liberty’s Ryan Gilbert finished third in 14:21.6, one spot ahead of teammate Garrett Ditter (14:40.3).